This article in Question & Answer format was based on information provided by the following specialists: Ronnie Gallagher, James Skinner, Hartmut Mueller, Seid Huseinov. PHOTOS Hartmut Mueller, Adil Aliyev, Ronnie Gallagher, Oleg Litvin. 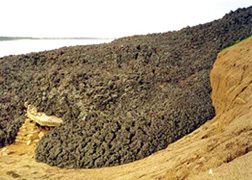 Mud volcanoes are essentially channels for releasing pressurized gas and mineral water. They sometimes contain traces of oil, together with associated mud from great depths within the earth (often as deep as 8-12km). Essentially mud volcanoes are open pressure valves in the earth's crust. They are often created at points of weakness in the Earth's crust, along fault lines. and T. I. Hasanaliyev. In Russian. Above middle: "All about Mud Volcanoes,"
published in English, was sponsored by BP. Nafta Press: 1997. Above right: Small mud volcano eruption. 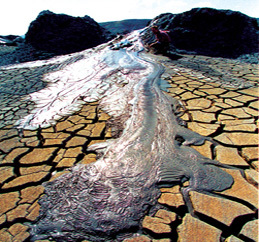 What is the relationship between mud volcanoes and oil? Mud volcanoes associated with hydrocarbons resemble super-deep exploration wells in the sense that they can be direct indicators of petroleum deposits at great depths and provide valuable information on the formation and migration of oil and gas. Both mud volcanoes and hydrocarbon fields are the result of a single process of oil and gas formation, which has a characteristic vertical zone with methane gas forming in the younger strata, overlying a zone of intense formation of oil and gases. How are mud volcanoes similar to lava volcanoes? Mud volcanoes and lava volcanoes are considered to be close cousins. Both can be enormously powerful. Both seem to be unpredictable in terms of when they will erupt. Both can hurl out flames and billows of smoke to great heights, sometimes several hundred meters. Both can spew out millions of cubic meters of clay from the bowels of the earth. Both can create islands if they erupt from the floor of the sea. entire series of photos about mud volcanoes, says this is, indeed, a rare sight. 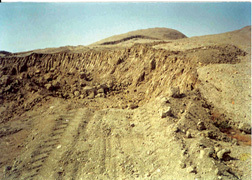 Above right: Mud flow at Dashgil. Photo by Dr. Adil Aliyev. Well then, how are mud volcanoes different from lava volcanoes? They're quite different in terms of temperature. Lava volcanoes originate from molten rock or magma, which generate enormously high temperatures as fires escape from their cones during eruptions. Mud volcanoes result from an increase in pressure underground and the release of fluids in mud and associated gases. They are not necessarily hot, though they may be. In fact, material spewed out from mud volcanoes can be quite cool, sometimes even close to freezing temperatures. How many mud volcanoes exist in the world? It all depends on how you define mud volcanoes. Do you call a little cone, no higher than a foot or so, a volcano if mud happens to ooze from it? If so, then there are hundreds of thousands of them scattered throughout the world. However, scientists generally refer to about 700 mud volcanoes around the world. for the Nobel Brothers described such an occasion that took place there in 1887. Photo by Dr. Adil Aliyev. More info: search at AZER.com. 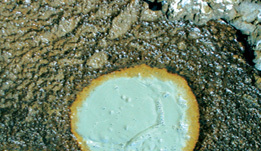 Above right: Mud volcanoes emit muds of varying colors and consistencies, including oil. Photo by Hartmut Mueller. Where are mud volcanoes primarily found? They can be found all over the world. The greatest concentration of them is found in Azerbaijan, Turkmenistan, and the South Caspian region. Specifically, more than half of the world's mud volcanoes are said to be located in Azerbaijan. Mud volcanoes have also been found in Australia, Taiwan, Trinidad, China, Myanmar, Iran and Pakistan. Only a few exist in Europe: the Kerch Peninsula in southeastern Ukraine between the Black and Azov Seas, the Apennines mountains in southern Italy and Sicily, and the Carpathian mountains near Berca, Romania. How many mud volcanoes exist in Azerbaijan? Again, the number would vary according to one's definition of the term, but several hundred sizeable mud volcanoes have been identified by geologists in Azerbaijan. Why are there so many mud volcanoes located in Azerbaijan? 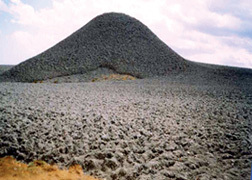 Mud volcanoes are associated with oil and gas prospects often within hydrocarbon source rocks. Hydrocarbon deposits are estimated to be very high in Azerbaijan, especially in the lower geological sections of the middle Pliocene, Paleogene-Miocene and Mesozoic layers. Do mud volcanoes occur only on land? No, like their igneous cousins, mud volcanoes can also be found on the floor of the sea. How large can mud volcanoes be? Mud volcanoes differ greatly in size. Usually, their height does not exceed more than 1-2 meters although some mud volcano mounds grow to around 500-700m high. In width, they can range from a few centimeters to a few kilometers. 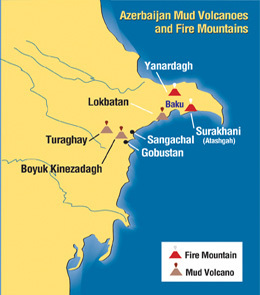 Left: Map of general locations of mud volcanoes and fire mountains on the Absheron Peninsula and to the south of Baku along the Caspian coastline. Azerbaijan seems to have been aptly named "Land of Fire." 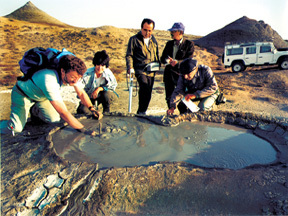 Azerbaijan has an estimated 200-300 mud volcanoes of varying sizes. What are the largest mud volcanoes in Azerbaijan? The largest mud volcanic mounds in Azerbaijan are like mountains. Two of them are gigantic: Kinezadagh (397m high) and Turaghay (400m high). Both are located southwest of Baku along the coastal region of the Caspian. See Mud Volcano and Fire Mountain Map on page 40. Above left: Kinezadagh, second largest mud volcano in Azerbaijan (397m high). Above right: Eruption at Kechaldagh. Photo by Phil Hardy. When Turaghay erupted in 1947, it emitted some 50,000 cubic meters of breccia / mud. Even if such a large quantity of mud were typical of an average eruption, the formation of a mountain this size would have required approximately 6,000 eruptions. Since mud volcanoes are comprised of soft and fluid mud, they are considered to be rather ephemeral on a geological timescale because they are prone to erosion. With wind and rain, the mud quickly erodes into systems of gulleys and ridges fanning out from the crater margins. Indeed, the tell-tale sign of a mud volcano is its deeply grooved and flanks sides which often are very attractive. Above left: Mud volcanoes at Shirvan. Photo by Dr. Adil Aliyev. 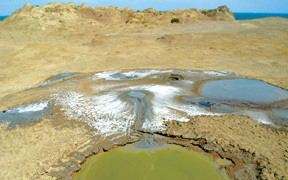 Above right: Close up of small mud volcano at Dashgil. Photo by Dr. Adil Aliyev. Are there different kinds of mud volcanoes? Like an igneous volcano, the mud can be fluid and flow easily, or it can be thick and sticky. 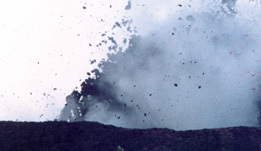 The first kind tends to erupt continuously in a bubbling manner, while the second type tends to be explosive and produce spectacular fireballs when it erupts (like Lokbatan). How old are mud volcanoes? In the scheme of geological processes that spans millions of years, mud volcanoes are viewed as being fairly recent. It's hard to determine how old a specific mud volcano might be. Many may be tens of thousands of years old. Like all mountains, both time and weather cause them to erode once they cease to be active. Of course, new volcanoes can form anytime. Above left: A flood plain of mud from an eruption at Shirvan. Photo by Dr. Adil Aliyev. 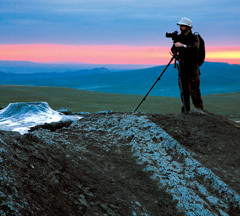 Above right: The art of photographing mud volcanoes. Photo by Hartmut Mueller. And what is the mud composed of? Basically, mud volcanoes emit gas, water and sand and occasionally oil. Ejected materials are often comprised of a slurry of fine solids suspended in liquids, which may include water (frequently acidic or salty) and hydrocarbon fluids. About 86 percent of the gases that are released are methane. Also carbon dioxide and nitrogen are emitted but in much less quantities. Occasionally sedimentary rocks from within the earth are entrained in an eruption and get carried to the surface. Chemically, volcanic mud is composed primarily of silica (55-70 percent). In addition, this mud has been found to contain quantities of curative properties (iodine, bromine, calcium, magnesium, organic acids and aromatic hydro-carbons-to name just a few). As the mud solution has no significant toxic substances, it has been recommended as a curative agent for mud baths and use at spas. 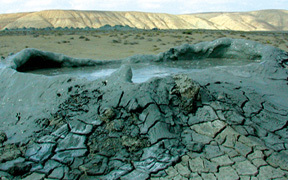 There is potential for Azerbaijan to develop its own spas from this volcanic mud. Above left: Dried-up outflow of a mud volcano. Above middle: A small bubbling mud volcano. Above right: Nature's beauty can even be found in patterns of mud flowing from volcanoes. See magazine cover. Photos by Hartmut Mueller. When do mud volcanoes seem to be the most active? 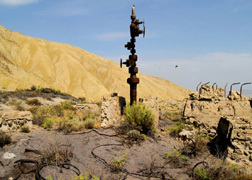 Azerbaijani scientists have noted a close relationship between earthquakes and mud volcano activity. Often both occur in close succession to each other. Above right: Mud flow. Photos by Dr. Adil Aliyev. From data gathered between 1810-2001 on eruptions from 77 volcanoes in Azerbaijan, Central Asia, supplemented with reports from mud volcano eruptions in Japan, Romania, Pakistan and the Andaman Islands, correlations were found between eruptions of mud volcanoes and earthquakes. The results indicate that both often occur on the same day as earthquakes, especially if there are major earthquakes within a radius of 100 km. This assumed magnitude / distance relationship for triggering observed in the Azerbaijan data is consistent with documented earthquake-induced mud volcano eruptions elsewhere. There is also a heightened correlation with the number of mud volcano eruptions that occur within one year following large earthquakes. The triggering of the volcano likely results from some aspect of the passage of seismic waves, but the precise mechanism remains unclear. Above left: Mud volcanoes signal oil and gas deposits. Photo by Hartmut Mueller. that there is a relationship between eruptions of mud volcanoes and earthquakes in the region. Photo by Dr. Adil Aliyev. How have eyewitnesses described volcanic eruptions? A description exists of an eruption that took place at Lokbatan on January 5-6, 1887. It was discovered in the personal diary of Swedish geologist Hjalmar Sjögren, who was employed by the Nobel Brothers Petroleum Company at the time. Sjögren wrote: "At Puta station, I questioned everyone thoroughly. They told the interpreter and me that at the beginning, the ball of fire was about 75 meters high. The explosion was of such magnitude that everyone was awakened from sleep. The heat-even at a distance of 2 verst from the volcano-was very uncomfortable and disturbing. The thundering sound of the eruption drowned out the sounds of trains." Read more: "Mud Volcano Eruption. "Lokbatan: An Eyewitness Account in 1887," by Brita Asbrink, Azerbaijan International, 11.2 (Summer 2003). Search at AZER.com. Lokbatan erupted again most recently on October 10, 2001. Eyewitnesses described it like this: There was a huge explosion and a huge flame started coming from the hillside. It looked as though an animal was trying to crawl out of the earth. The flames were unbelievably high-about 300 meters high. It was surrounded by dense, black smoke, and lots of mud was being thrown into the air. The largest flames burned for about five minutes. Then there was another huge explosion, and then the flames settled down to about 10 or 20 meters high. The flames could easily be seen 15 kilometers away on the day of the explosion. Three days later the volcano was still burning, although at a much-diminished rate. Above left: Sampling contents of a mud volcano for scientific analysis. Photo by Oleg Litvin. mud is recognized for its therapeutic and cosmetic attributes as well. Photo by Ronnie Gallagher. Are eruptions predictable? Can you tell when a mud volcano is about to "blow"? Basically, no. The life of a volcano extends over a long geological period and is characterized by both active and extinct phases. Dormancy occurs between the eruptions, which may take place every three or four years or as seldom as 80-90 years as with Bozdagh. Some 50 volcanoes have been erupting in the eastern region of Azerbaijan during the past 200 years since documents were kept. The Institute of Geology of the Azerbaijan Academy of Science has discovered that Lokbatan has erupted the most often-20 times since its history has been recorded. What should you do if you were ever in an area when a major mud volcano began to erupt? 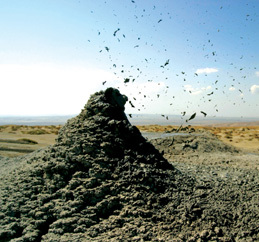 Eruptions of mud volcanoes have seldom been violent in Azerbaijan. They mostly just bubble away. Fortunately mud volcanoes in Azerbaijan generally occur away from populated centers and don't usually result in disastrous consequences. However, eruptions can be dangerous if lots of pressure has built up inside the cone. If that happens, a large amount of gas can be released and there is risk of asphyxiation for any human being or animal that might be nearby. There is also risk that the gas plume could catch fire. Sometimes landslides result. According to local residents, a volcanic eruption which once took place in Bozdagh about 90 km northeast of Shamakhi resulted in the deaths of six shepherds who happened to be camping overnight in its crater. About 2,000 sheep in their flock were also killed. However, in Porong, Indonesia, a recent mud volcano that began erupting in May 2006 and continued until November that same year was extremely devastating. Initially, it killed 13 people. But so much mud flowed from it that the entire community has now been destroyed. More than 12,000 people were evacuated. More than 1800 homes were destroyed along with 20 industrial plants, 18 schools and 12 mosques, not to mention the many rice fields which people rely upon to make a living. 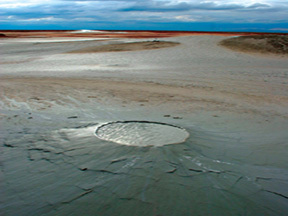 Experts say that the Porong Mud Volcano is one of the largest ever. The Porong Volcano is believed to be associated with oil exploration and the breaching of a containment layer, which released the underground pressure. The mud, believed to have come from a reservoir 3.5 miles below the surface became pressurized by shifts in the crust or by the accumulation of hydrocarbons. National Aeronautics and Space Administration (NASA) scientists from the United States have recently contacted Azerbaijani scientists about mud volcanoes. What are they interested in learning? James A. Skinner, Jr. of the U. S. Geological Survey Astrogeology Research Program has recently been focusing on cone, dome, and crater formations on Mars and has detected a similarity in appearance to mud volcanoes. As Azerbaijan is the world center of mud volcanic activity, he anticipates visiting Baku to learn more of these features and their formational processes in hopes that such findings will shed light on geological formations observed on Mars. What kind of effect do mud volcanoes have on the environment? According to John Woodside, a geologist at the Free University in Amsterdam and one of the leading researchers in the Medmud Project, which is investigating volcanoes on the bottom of the Mediterranean, mud volcanoes can cause both positive and negative effects on the environment. On the sea floor, they provide a unique ecosystem for bacteria, with their abundant heat and minerals. However, on land the methane gas, which can be produced in significant amounts during eruptions, is a very potent greenhouse gas. While it breaks down to carbon dioxide fairly quickly in the atmosphere, methane gas does contribute to Global Warming. The total volume of gas emitted by all mud volcanoes in Azerbaijan is estimated to be about 20 million cubic meters each year. What do you find particularly curious about mud volcanoes? That so few people actually know about these fascinating structures. Where can tourists see these mud volcanoes in Azerbaijan? Mud volcanoes definitely should be part of any tourist's itinerary here. So many of them are within close proximity to Baku, such as at Alyat and Gobustan. Mud volcanoes come in a variety of shapes and sizes, but those most common in Azerbaijan have several small cones, or vents. These small cones are an amazing sight. They are often characterized by sizzling or rude gurgling sounds, which delight children. Periodically, small explosions can be heard in the distance. On hot summer days, mud volcanoes can provide hours of entertainment. Come prepared: bring plenty of clean clothes, plastic bags for muddy clothes, and your own supply of water to wash off afterwards. How should visitors preserve the area when they visit mud volcanoes? With the limited number of tourists that visit Azerbaijan today, the volcanoes don't seem to be under any serious threat. However, with their distinctive 'lunar' landscape, scientific interest, tourist and spa potential, there is the possibility that one day too many tourists could lead to inevitable degradation and damage. Mud volcanoes are themselves unique monuments and need to be protected for future posterity. Visitors today should take personal responsibility care to keep the area clean and gather up their own liter. Everyone should commit to preserving these natural and rare phenomena so that future generations can enjoy them, as well.